Insert the key in the ignition switch. The system recognises the starting code. 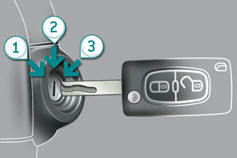 Turn the key fully towards the dashboard to position 3 (Starting) .